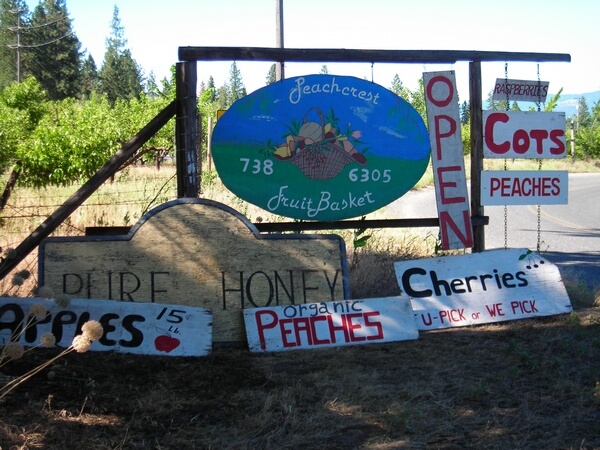 Peachcrest Fruit Basket Organic Orchard. There are lots of photos, and a helpful Q&A. Have you ever wanted to own a Certified Organic orchard? Something that’s not too big to manage but big enough to generate an income. Somewhere that’s not too far from a sleepy little town, while at the same time gives you the feeling of seclusion. A place where the air is clean, the water is pure enough that no nasty additives need to be used and you can drink straight from the faucett with no worries. A place where you can dig a 6 foot hole in the sandy loam with a hand shovel and that is within ten minutes walk to a large body of water and the scenery around you is mountainous and picturesque and the neighbors are friendly, quiet and helpful. A place where you can pick as much tree ripened fruit as you like such as the famous peaches that grow around here along with juicy cherries, mouth watering apricots that taste like real fruit, as well as pears, raspberries, and nectarines and much more. Living in this kind of an environment is very rewarding and the benefits are many, such as healthy life style, supporting environment, personal health, peace of mind, great place for children to grow up, self sufficiency, community, self dependence, self reliance, living in harmony with nature, just to mention a few. So, if you like what you have been reading, please take the time to read on. You may find this is just what you have been looking for and don’t hesitate to send us an email or call with any questions you may have and thanks ahead for checking it out. Categories: Work + Land opportunities | Permalink.